Our services start with your arrival atSrinagar airport. Meet & greet and transfer by Car to Sonmarg. 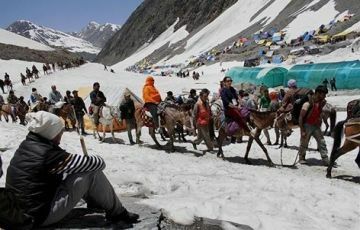 Arrive Sonmarg & check in your booked Hotel / Swiss Camps. Rest of the day at leisure. Dinner & Overnight stay at Sonmarg. 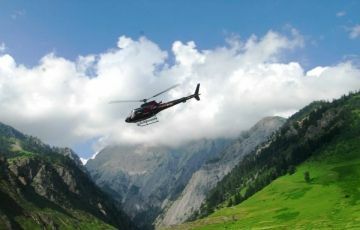 After early breakfast short drive of 15 Kms will take you to Baltal (Helipad) Baltal- Panchtarni -Baltal helicopter ride. The Helicopter start operating at 06.00 Hrs (Weather Permitting). Panchtaraniis approx 6 Kms fromHolyCave, you can go there by Foot or can hire Palki/Pony at your own cost. After darshan return back to Panchtaranito board helicopter to Baltal. Return back toSrinagar. On arrival check in your hotel / houseboat. Dinner & overnight stay atSrinagar. After breakfast time is free till departure. Check out from the houseboat / hotel. Transfer you to the airport to connect your flight to your onward journey. * M/S MARIAS KASHMIR HOLIDAY TOUR AND TRAVELS. will not be responsible for any mishap/accident/injury/death/ Natural disaster during the course of the tour. 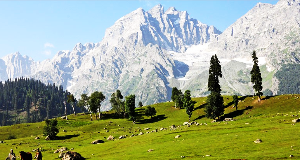 * M/S MARIAS KASHMIR HOLIDAY TOUR AND TRAVELS. is a private travel agency. 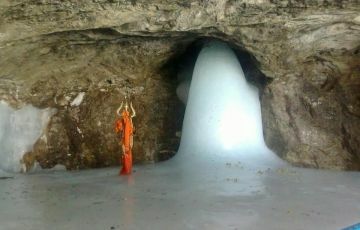 We are just providing Amarnath Yatra Helicopter Packages. We are not authorized to sell just helicopter tickets. * No Cancellation or any refund will be made at any cost in case of bad weather or land-slide or any other natural disaster or political/national crisis due to which the customer could not reach the destination/ airport/ railway station/ bus stand, which is beyond the control of the Agent/Hotel. It will be entirely at the risk and cost of the customer. All customers have to manage their stay / Air, train & Bus fares at their own cost for that day. * Price excludes airfares, train fares, bus fares personal expenses like laundry, telephone, tips, Mineral Water bottles, room services ponies, palkies charges etc.